Caritas is working on several innovations to help bring environmentally-friendly, transparent, good-practice relief assistance to communities around the globe. plans to map the needs for training local partners to participate in the International Aid Transparency Initiative. 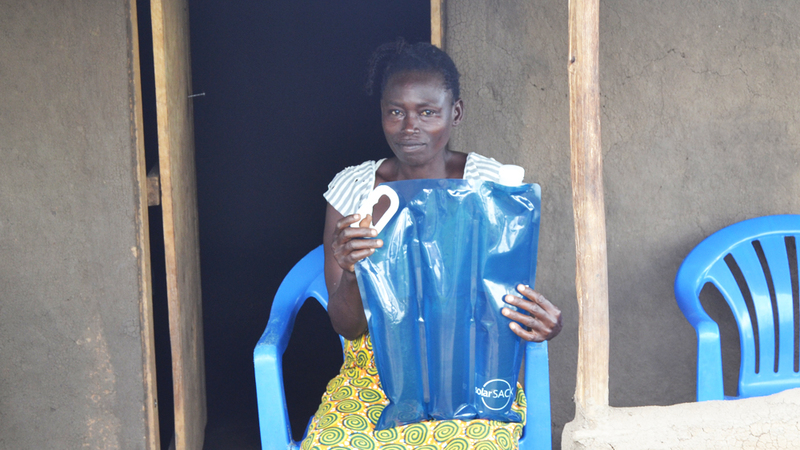 One of the women in Uganda who will by trying out the solarsack. Caritas and the Danish start-up Solarsack are aiming to bring clean water to developing countries. Their project will support local economies and remove the need for wood fuel to boil water. Solarsack has invented a plastic bag that can purify water when it is exposed to sunlight. Each bag contains four litres that becomes purified when it has been exposed to the sun for four hours. 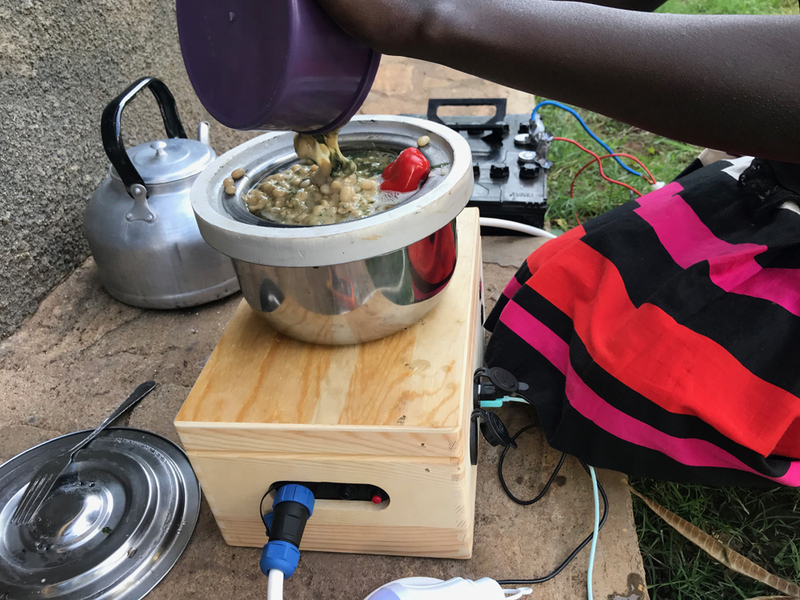 The low-cost, portable, energy-friendly solution is now ready for testing in Uganda with Caritas’ partner, Community Integrated Development Initiative (CIDI). The project’s first phase includes setting up and observing the use of the Solarsack. This will take pace in rural villages and in the refugee settlement in Kyangwali in Western Uganda. “In the first phase, we are focusing on the potential users to see what it takes for them to understand how to use the product correctly,” said Alexander Løcke, founder and CEO of Solarsack. Alexander from solarsack helps train people in Uganda in how to use the solar powered water filter. The second phase of the project is scheduled to take place during the spring of 2019. By then, 1,000 solar sacks will be distributed for testing in Uganda, Chad and Myanmar. The third and final phase is expected to be implemented later the following year. By then, the business model will also be ready for testing. It will focus on women in Caritas-supported savings-and-loan groups who will sell the Solarsacks through a Tupperware-inspired business model. This will build a local economy. At the same time it will solve the challenge of lack of access to clean water. Caritas Denmark helped test the solar cookers in Uganda. Caritas has also partnered with Pesitho to give communities solar-powered cookers. Pesitho is a new Danish socio-economic enterprise committed to provide off-grid solar power solutions to the world’s poor. Pestiho has developed the a device which they call ‘ECOCA’. It is a solar cooker and solar home system in one. It consists of an electric stove top, a battery pack and a solar panel array. This provides a potential solution to the deforestation taking place in many settings globally, especially around many refugee settlements. ECOCA comes with a highly insulated pot which will keep food warm for hours. The cooker uses small, compact solar panels to generate electricity which is stored in the built-in battery. In a standard configuration, an average sub-Saharan rural family will easily have its daily cooking needs covered by the cooker. The battery pack is sufficient to ensure efficient running of the kitchen for several hours after dark. The cooker is also fitted with a standard USB port for charging smartphones and an AUX power outlet for small appliances such as razors. The unit is equipped with an LED light, making indoor activities such as education and handcrafts possible after sunset without the usage of conventional fuel sources. In this way, the ECOCA also functions as the family’s power supply with no operational costs. The cooker has been designed to be affordable in price. It is therefore possible for government organisations, relief agencies, or even private citizens to buy the unit. Its functionality has been verified in Denmark, but the product will be tested by Caritas partners in Uganda and Myanmar from January to April 2019. One hundred cookers will be distributed to the most vulnerable households in two places where refugee and Internally Displaced People live. A mid-term review will be conducted by Caritas Denmark and Pesitho in early March 2019. 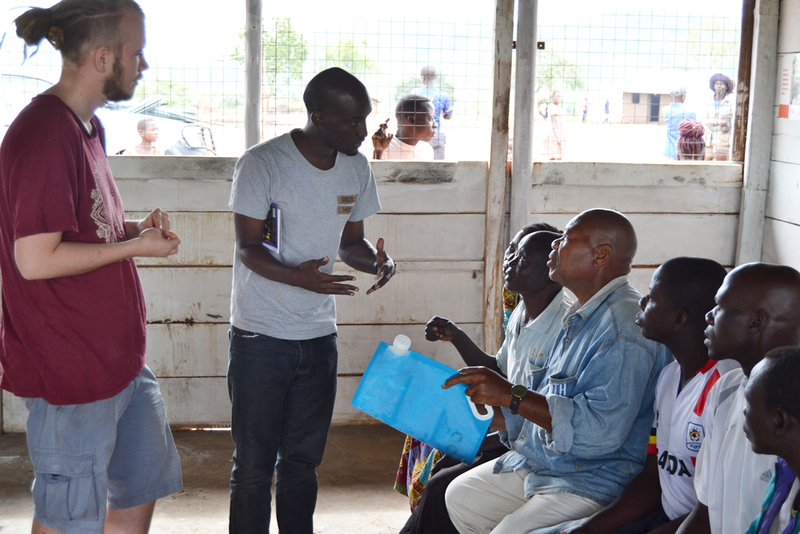 By May 2019, Engineering students from Aarhus University will collect data from the 100 households and evaluate the pilot. Based on the learning from the test, Pesitho will be able to optimize the product to fit the needs of these markets. For example, they may decide to change the size of battery and solar panel. Once tested, the aim is to copy the set-up all over Uganda and in other countries with a market demand for the product. Bangladesh, Chad and Niger are likely to get the ECOCA in the second phase of the project. It might take a long time before local production is established and matured for the relevant markets. Therefore, as soon as the test in Uganda and Myanmar is successfully completed, Pesitho will start large-scale production as a temporary arrangement. Caritas is part of the International Aid Transparency Initiative (IATI), a global initiative to improve the transparency of development and humanitarian resources and their results to address poverty and crisis. For Caritas to honour its international commitments, it must help find cost-efficient ways to support local partners in publishing their data through the IATI registry. Consequently, Caritas is mapping the need for IATI support among local partners in Uganda with a view to creating private sector service centres to offer training. Based on this mini-study of local partner needs, Caritas Denmark will design an approach to provide IATI Advisory Services, which will be piloted in Uganda in 2019. The pilot will aim to build a permanent in-country capacity to allow the IATI Advisory Services to become available to all other civil society organisations (CSO) beyond Caritas partners. The study will seek to identify the motivation and expectations of selected CSOs towards publishing data through IATI; and to describe potential gaps in the inhouse capacity of CSOs for publishing data through IATI. It will also establish the concerns related to transparency in a context where space for civil society is shrinking and recommend solutions for concern-free IATI publishing. The learning from this pilot is expected to be instrumental globally for IATI publishers and other stakeholders committed towards aid transparency, who are facing the same challenges, and are motivated to build IATI capacity elsewhere. For Caritas, a significant element in this initiative is that it will allow local CSOs to report data on a par with international NGOs giving them the same advantages to demonstrate results to donors and other interested stakeholders.